In 1765 , a grassy field near the ‘Ecole Militaires’ (military training school) was trimmed and cut into what became the ‘Champ du Mars’. It was named after Mars, the Roman god of war. 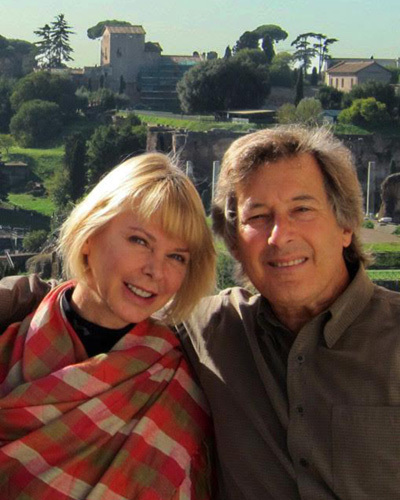 It was also named for the Campo Martius in Rome. Campo Martius was used as a military training ground for the ancient Roman army. Champ du Mars had a very similar use in Paris of the late 18th century. On July 14, 1790, the first anniversary of Bastille Day was celebrated on Champ du Mars. It had been 1 year since the start of the French Revolution. A year later, in 1791, the 1st Mayor of Paris, Jean-Sylvain Bailly was guillotined on Champ du Mars during the ‘Reign of Terror’ that followed the Revolution. In most cases, a Revolution has an evolution of it’s own. In the France of 1790-91, it got pretty out of control. The architects of the Revolution eventually became the victims. In 1889, Paris celebrated the 100th anniversary of Bastille Day, with the ‘Exposition Universelle’, a World’s Fair that covered Champ du Mars and spread out across the 7th and 8th arrondissements. The Fair cost over 41 million Francs to build but between May and October of 1889, ticket income brought in over 49 million francs. It was a big success. I’ve read that 1 French franc in the 1880s was worth about $4 in today’s US currency. William ‘Buffalo Bill’ Cody and Annie Oakley performed at the ‘Exposition Universelle‘ for packed audiences. France showed off the 184.5 Imperial white (Jacob) Diamond, which at the time was the largest in the world. France also recreated a life size replica of the Bastille. The symbol (and the entrance arch) of the ‘Exposition Universelle’ was the Eiffel Tower, which in many ways is still the symbol of Paris. The 1063’ tall steel frame was pretty controversial when it was proposed. Even Gustave Eiffel had his doubts at first, but after a few redesigns Eiffel got more enthusiastic. Eiffel was not the designer of the tower, even though he gets all the credit. He was, in fact, the engineer. During the construction the public outcry was intense. A group of 300 leading artists and architects of the day known as the ‘Committee of Three Hundred’ skewered the project as a giant smokestack and barbaric hulk casting a black shadow over the Dome of the Invalides, the Louvre, Notre Dame, Arc du Triomphe and other beloved landmarks. One member of the group, Guy du Maupassant (the father of the short story) eventually dined every day inside of the tower after it was built. He said it was the only place in Paris where he couldn’t see the awful thing. When the Exposition was over the plans were to keep it up for 20 years and then tear it down and sell it for scrap. However, this was also the beginning of the age of radio and the French Military discovered they had a great radio tower already in place. And there you have it. Although no-one died during the construction of the tower, it is estimated that around 400 people have fallen (or jumped) to their deaths. Two of them survived. In fact, one of the survivors, a woman who fell on top of a passing car, ended up marrying the car’s owner/driver. The Eiffel Tower could be one of the worst places one could contemplate committing suicide. It’s not a straight fall. Jumping from the top would inevitably get one stuck into the iron apron frame at the bottom of the structure. Even though the security measures against suicides are well enforced, the last successful attempt was made by a British man in 2012. When Daniel Burnham, the architect of the 1893 Chicago World’s Fair appealed to the architects of the world to come up with a grand piece that would rival the 1060’ Eiffel Tower of the 1889 Paris Exposition. Gustave Eiffel offered to build a 1,500’ version of his tower in Chicago. His idea was immediately dismissed. The showpiece of the 1893 Chicago World’s Fair was instead a 264’ high great Ferris Wheel designed by a Pittsburg PA bridge builder named George Washington Gale Ferris, Jr. There have been many Ferris wheels since the 1893 Fair. The current (and largest) is the ‘High roller’ in Las Vegas that tops out at 550’ high. It took a long time for the Parisians to accept the Eiffel Tower. It’s still an either you love it or hate it structure, but even if your hate it, you still look at in awe. It is a remarkable structure. Just as the Parisians were finally accepting the Eiffel Tower, along came the 1970’s, one of the most controversial architectural times in Paris, a time that included the inside-out Georges Pompidou Center, the disco nightmare known as Les Halles, and the monolith skyscraper of the Tour Pleyel in the Saint Denis suburbs. In 1972, when the 690’ tall La Tour Maine-Montparnasse tower was erected near the charming Luxembourg Gardens, the Parisians had enough. By 1977, all high-rise buildings were banned from the center of the city. These days the public outcries over ruining the Paris skyline are back. There are currently 12 new skyscrapers planned for Paris with architects ranging from the French Jean Nouvel, Roland Castro and Djamel Klouche to Italian Renzo Piano and British Richard Rogers (who by the way, was one of the architects of the questionable Georges Pompidou Center). Parisians don’t want Paris to be another architectural city like London. They’re content with the 19th century Haussmann design. Unfortunately, they’ll lose. 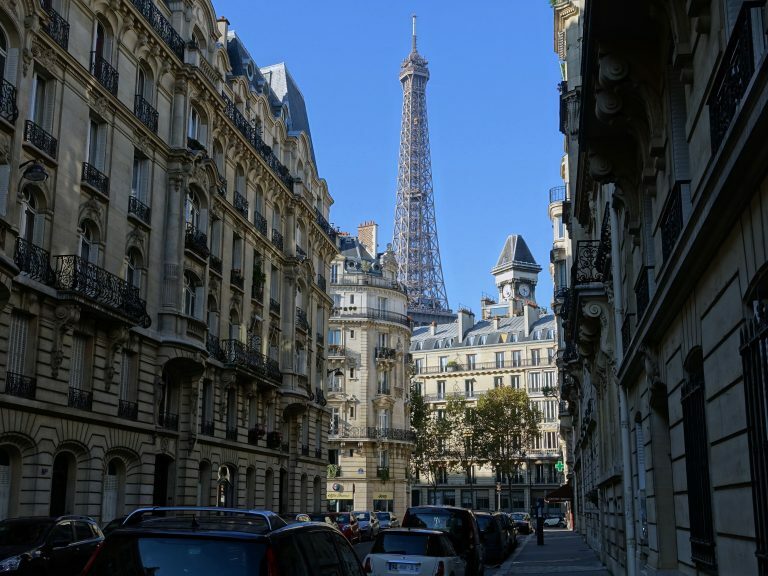 Aside from the new flagstones along the street of the Marais and the quaint revisions of other historic parts of the central 19th century city, Paris will become a modern city, with skyscrapers, modern hotels and lots of glass and metal. The monstrosity known as Les Halles, a shopping center that replaced the old food markets in the 2nd arrondissement has already been demolished (thankfully) and a new project is underway with large public gardens, large pedestrian walkways and a modern forest like superstructure known as ‘Le Canopée’. The new Les Halles will include 6,300 square meters of retails shops, a 2,600 square meter Music conservatory, a 1,050 square meter library, workshops and a large Hip-Hop Center. In the 125 year of the Eiffel Tower, over 250 million people have made the visit. Although many think the Eiffel Tower is one of the most visited sites in the world, they are way off. The Notre Dame Cathedral gets almost twice as many. The Louvre gets 25% more people and the Sacre Coeur Basilica of Paris gets 50% more people each year. I find it sad to report that the #1 tourist attraction in the world is the Las Vegas Strip. During the day, the Eiffel Tower still looks somewhat like the ‘giant smokestack and barbaric hulk’ described by ‘Committee of Three Hundred’ back in 1889. The color is different these days. It’s more of coffee cream beige. At night, it looks more like the Las Vegas Strip, washed in sodium vapor gold lighting with red, blue and white blinking lights at the top and an annoying tracking beam that searches the city like some kind of prison searchlight or alien invasion. ‘Klaatu Barada Nikto’. In 1789, the French Revolutionists stormed the Invalides, took the arms kept in the basement and used them to storm the Bastille. For some historians the storming of L’Hotel des Invalides was the start of the French Revolution. 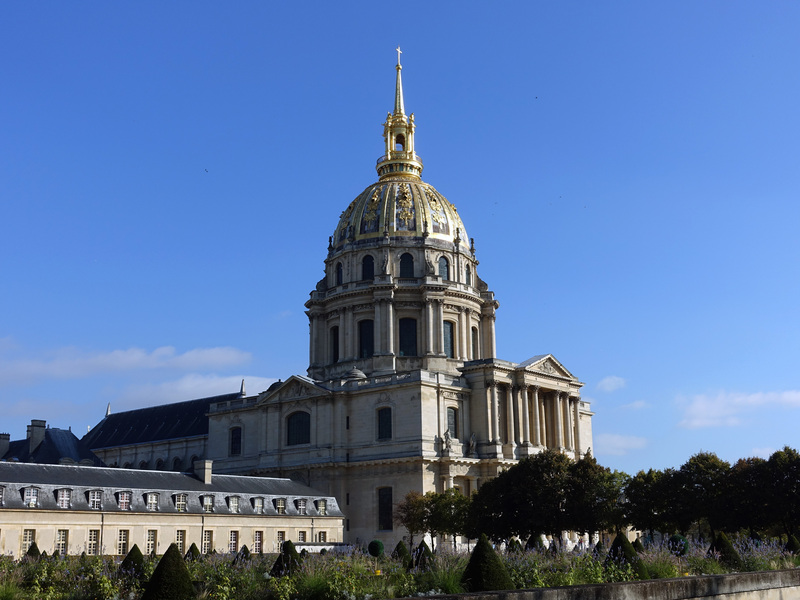 L’Hotel des Invalides was originally built by King Louis XIV as a hospital and home for soldiers of the wars. It still fulfills that purpose although it is also the Military Museum of Paris. The Dome of the L’Hotel Invalides has been the inspiration for such great buildings as the US Capitol Building in Washington DC and the San Francisco City hall. 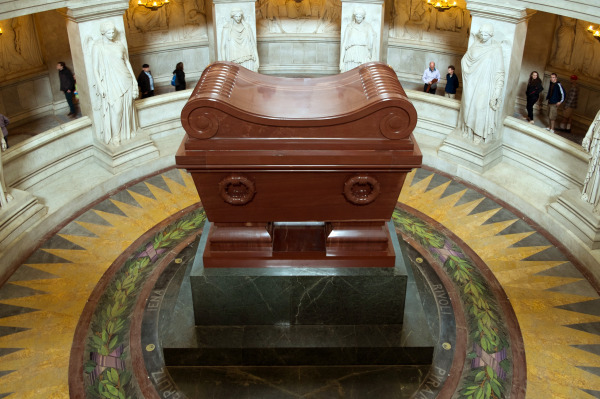 The main attraction of L’Hotel des Invalides is the tomb of Napoleon Bonaparte. He was interred here in 1840, his massive red quartzite tomb sits firmly on a green granite base. After Napoleon died on the island of St Helena in 1821, his body was placed into three coffins. The first one of tin was soldered shut. The second one of wood was screwed shut and the third one of lead was soldered shut. The three coffins were then placed inside a mahogany coffin and buried under two layers of cement and 2 meters of stones and clay topped with large stone slabs. On October 15, 1840, 19 years later, the grave was broken open and the coffins were unsealed to make sure Napoleon was still inside. He was. The three coffins were resealed and then placed inside a 4th lead casket and soldered shut. The now 4 casket coffin of Napoleon was placed inside the stone sarcophagus in the ‘Invalides’. Why all the trouble? Those involved wanted to be absolutely certain that Napoleon would never break out again, even in death. Over the years there have been many conspiracy theories. The main one being that the body in the coffin is really Napoleon’s butler, Cipriani and that Napoleon escaped St Helena and made it to either America or Australia. The mystery is still going on and as late as the 1990’s new clues to the switch of bodies were discovered. Yes, Napoleon lives on. The 7th arrondissement is actually one of the most relaxing (and wealthiest) neighborhoods in Paris. 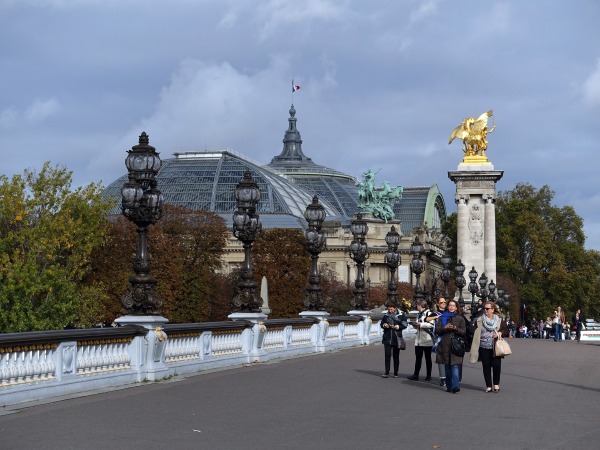 Aside from the Hotel Invalides and the Eiffel Tower, it contains the Musée D’Orsay, the Musée Rodin and the Musée du quai Branly, the indigenous art of Africa, Asia and the Americas that opened in 2006. It also is the home of the Bon Marché Department Store, which has the best food emporium in all of Paris. 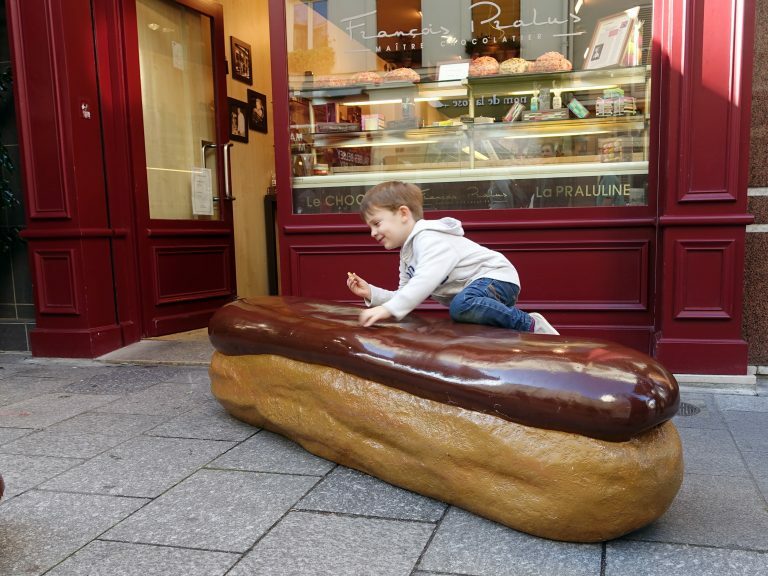 The foodie street of the 7th is Rue Cler. It’s a nice street with a good market but not any better than the food shops along Rue Montergueil in the 2nd (where Queen Elizabeth II shops) or the ancient Rue Mouffetard in the 5th or the ‘tres chic’ Rue de Buci in the 6th. What made Rue Cler famous is Julia Child who came to Paris in 1949. She was a former spy for the OSS (the precursor of the CIA). Her husband Paul was a US Diplomat. They lived in the 7th arrondissement near Rue Cler and this is where (according to legend) Julia learned about French food and French cooking. 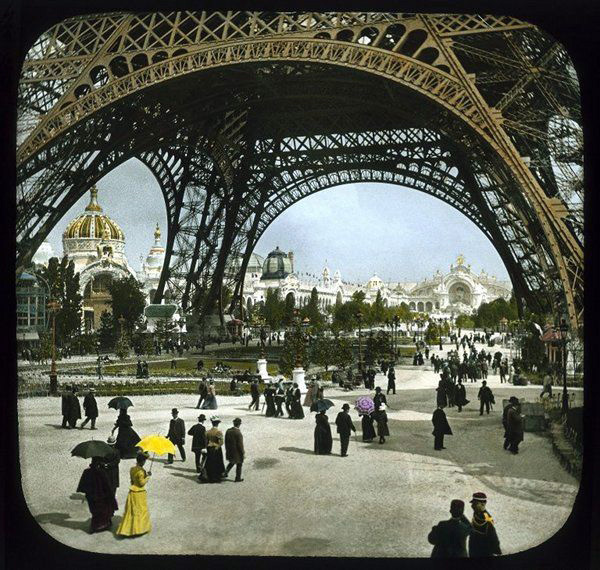 In 1900, Paris mounted another ‘Exposition Universelle’. Over 51 million people came to see it. The new railway stations Gare de Lyon, Gare d’Orsay and Gare des Invalides were built to get the tourists in. The first metro line of the ‘Métropolitain’ was constructed to get the Parisians to the Fair. The Eiffel Tower was still a prominent piece of the fairground but a lot had happened in the 12 years between the 1889 fair and the 1900 Exposition. The architectural and fashionable ‘Beaux-Arts’ and “Art Nouveau’ took Paris by storm and new buildings like the Grand Palais and the Petit Palais incorporated the new styles. The Grand Palais still has the honor of the largest glass roof in Europe. It was built with more steel than the Eiffel Tower. 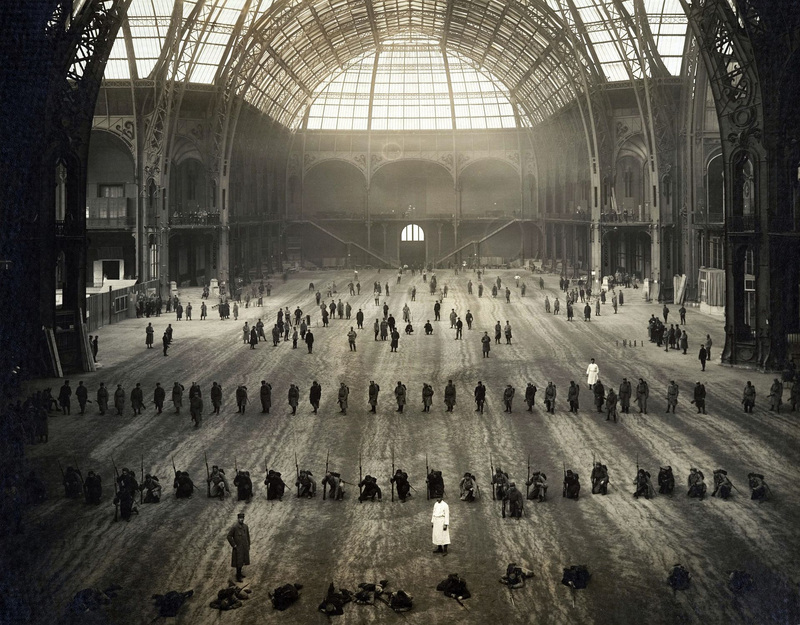 During 1914, the Grand Palais was used as a military hospital. These days it stages over 40 events a year and with it’s own Police station in the basement, the events and the building are very secure. The Petit Palais was built more as an Art Museum, which it still is, and a very good one. 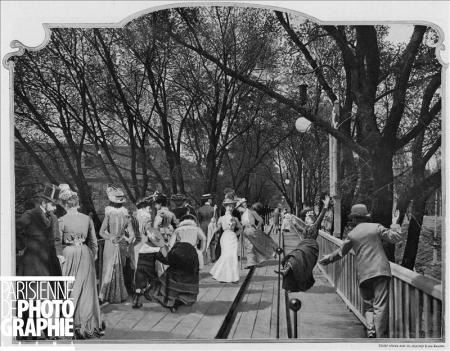 The 1900 World’s Fair featured the first talking movie and a 2 mile long (three lane) sidewalk. Each lane had a different speed. There was the first diesel engine (which ran on peanut oil), the enormous Palais d’Electricité that was completely lit with 5,000 multicolored incandescent electric light bulb. 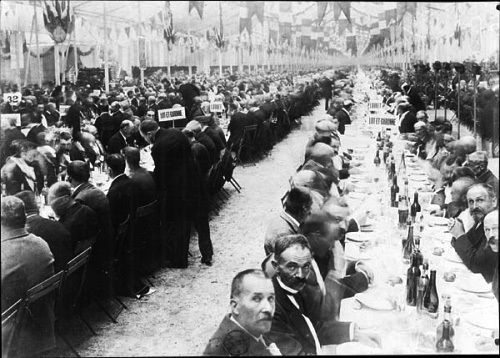 The 1900 Exposition also staged the largest dinner ever served for then French President Emile Francois Loubet along with 22.965 mayors from all over France. The meal of salmon, beef, duck, chicken, pheasant, salad and desert was served on 700 tables, each 33’ long. 39,000 bottles of wine were served against only 9,000 bottles of water. The Exposition took over the 7th and 8th arrondissements . 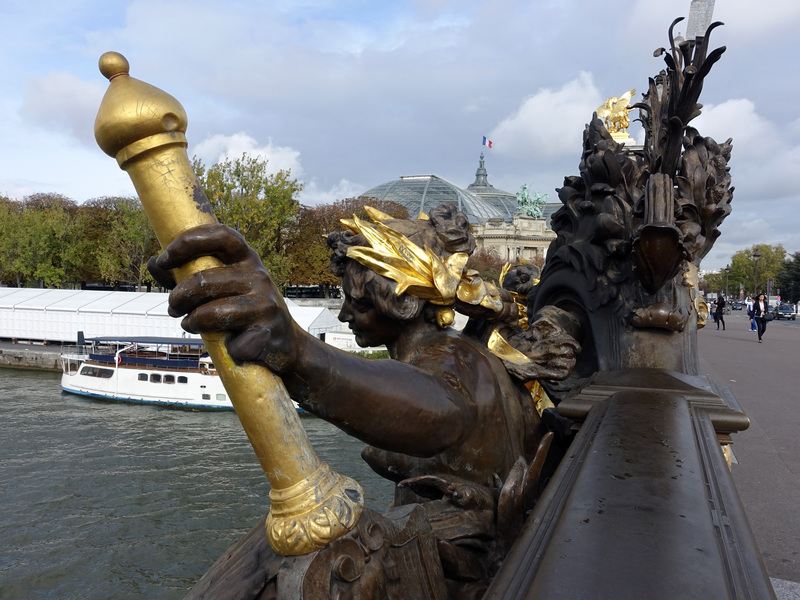 The gold gilded Pont Alexander III over the River Seine connected the Fair that ran from the Champ du Mars in the 7th to the Place de la Concord in the 8th. Tsar Alexander III’s Russia and France formed an alliance to keep Germany from getting too powerful. The alliance apparently wasn’t strong enough to hold off the alliance of Germany and Austro-Hungary, but the bridge still has the dubious honor of being the most ornate of the all the bridges crossing the Seine. 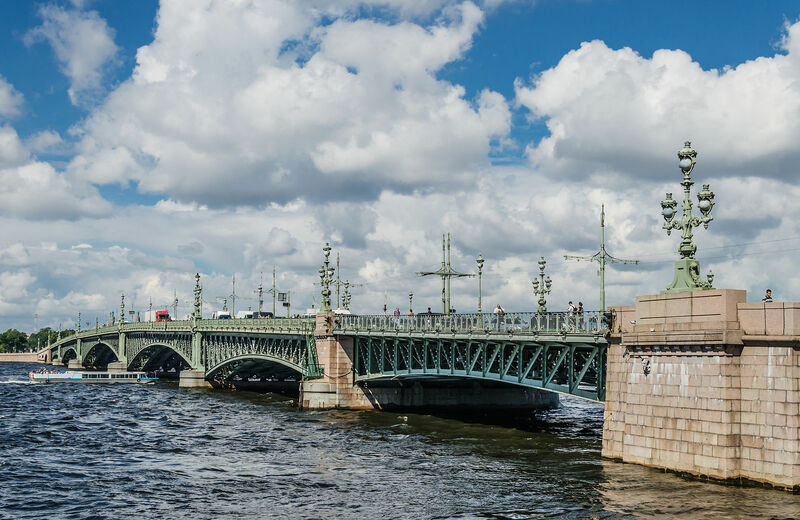 In honor of the alliance, Russia also constructed a bridge across the Neva River in Saint Petersburg. It was designed by Gustave Eiffel. It more or less looks like the Eiffel Tower laid on its side. It’s known as the Trinity Bridge.